Review: What’s So Controversial about Genetically Modified Foods? Editor’s Note: This is the first of two reviews I have planned of this important new book. On October 30, 2016 the Sunday NYT ran a large front-page article on the failed promises of genetically-modified organisms (GMOs), which have yet to demonstrate significant productivity gains or pesticide reductions for food producers and arguably raise risks of health or environmental harms for everyone. Without argument, the increase in GMO seeds and related agronomic management practices have put more control over agriculture and the food supply into the hands of a few large and ever more concentrated ag-industry players and thereby reduced farmer and consumer leverage over their food resources. As food and nutrition anthropologists are well aware, food is basic to social, cultural, and biological life, and therefore of utmost concern to most people. It is in this context that increasing industry dominance over the food supply, intellectual property rights over genes and consumers’ lack of trust or trustworthy information about food have become the hottest food controversies in the US and many other places. For proponents, GMOs symbolize that great possibilities science and technology plus global corporate management systems offer for improving agricultural efficiency and effectively reaching growing populations with nourishing food. For opponents, by contrast, GMOs are symbolic of scientific arrogance and corporate greed; they encapsulate all that is wrong with twenty-first century, un-sustainable, unhealthy, and environmentally destructive food systems. Most non-experts are confused; they wonder what to believe about the claims and counter-claims regarding the health and safety of GMOs, including whether they should be embraced or banned. 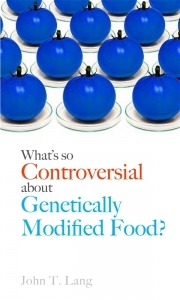 This small-format volume, in 139 short pages of text, sorts out the major controversies surrounding genetically-modified (GM) foods that since the late 1980s have been “remaking the global food system.” The author, a sociologist, argues that GM foods epitomize the risks that industrial, Big Ag and Big Food control over world food systems pose to sustainable food systems. A virtue of these controversies is that, in the best of all possible worlds, they awaken consumers, producers, marketers, and regulators to the challenges of ensuring healthy and sustainable diets and food supplies now and in the future. The most pressing issues concern climate and environmental change (including degraded soils, scarcer clean water, reductions in biodiversity), inequitable access to nutritious food, and poorer nutritional choices with harmful health consequences. These elevated risks are connected to the economics and politics of food and agriculture, which find increasing concentration and vertical corporate control over globally integrated food-value chains from farm to fork. Anti-GM positions assert that solutions must be tied to greater citizen awareness, activism, and actions that can hold the private corporate sector accountable. Pro-GM advocates similarly call for greater citizen understanding of GM crops and foods to reduce unwarranted fears and anxieties. These issues need even more urgent attention in an era of rapid scientific and technological change, which includes genetic engineering of plants, animals, and foods that no longer fit the definition of GM because gene-editing (CRISPR technique) does not involve transfer of foreign genes between species, but instead re-arranges the organism’s own genetic make-up to eliminate unwanted and enhance desirable products or characteristics. The focus on GM as opposed to the underlying issues, Lang argues, undermines attention to these essential core concerns, which he summarizes in four chapters: (1) “The Illusion of Diversity,” (2) Intellectual Property: Protection or Overreaching?” (3) “Scary Information? Labelling and Traceability,” (4) “Scientific Fallibility: Contested Interests and Symbolic Battles.” The final chapter (5) articulates “the tension between idealism and doom” that characterizes social and cultural responses to perceived threats of the public’s loss of control over their food, which is basic to human biological, social, and cultural life. He suggests that “getting back on track” will require all players in these controversies to attend to the real and present dangers, instead of flash points and conflicting self-interests. These immediate and longer-term threats include chemical pollution in agriculture; scarcities of land, water, and fertility in areas that should be producing food for local people to eat; and the need to have genetic and pest-response resources in place for the changes already taking place in the context of environmental and climate change. This final chapter articulates the well-known “systems” adage that would-be correction of one factor in the food system usually raises another of equal or greater concern (e.g., conservation tillage reduces run-off and soil erosion but increases soil-surface phosphorus concentrations that can pollute waterways, raise algal blooms and cause fish die-offs). It also homes in on the lack of consumer trust in those promoting or regulating GM foods, a focus that serves as a substitute for their more general lack of understanding and distrust of expert scientists and the government officials who oversee food safety. Lang, who at the end admits to holding a “neutral” position on GM foods, sees the GM controversies as a chance to address the underlying inequalities in production and distribution, the lack of democratic control over food systems, and the challenges of global environmental and political-economic change. Only through greater consumer education and activism, based on more transparent food systems, can more sustainable approaches to healthy nourishment and agricultural environments address these pressing challenges. These generalizations, with supporting information carefully organized into focused chapters are the volume’s strength. The lack of complete scientific clarity in accounts is the volume’s weakness. Its weaknesses are inadequate communication of the science and technology; the text misses the mark by not emphasizing that, despite no surprising findings of impaired health or unexpected environmental consequences (i.e., co-evolution of pests and higher applications of herbicides were anticipated) all future GM products must be evaluated for the new risk factors they introduce. As a bio-cultural anthropologist who has been tracking agricultural biotechnology since its beginnings, I found the introductory explanation of the GM process, which the author attempted to simplify, overly technical and unduly difficult for non-scientists to understand. His presentations of the major GM scientific publications and public-relations controversies were either incomplete or misleading. For example, the Cornell study that showed Bt-corn-pollen-kills-monarch-butterflies was controversial because the scientists presented known, uncontroversial information (that Bt-corn pollen, if consumed by butterfly larvae, will interfere with their feeding so that they die) but did not clarify the risk that the pollen would be present and persistent on the milkweed, the preferred food-source of butterfly larvae that feed at the edge of GM cornfields. Lang summarized the controversy surrounding the findings of organ damage to experimental rats fed GM modified potatoes carrying a pesticidal protein. He pointed out that Pusztai, the researcher who reported these scary findings to the media, not to his scientific colleagues for peer review, lost his job and professional standing, an outcome that Lang contrasts with the Cornell researchers, who were able to continue their work because they acknowledged the additional studies that might be required. But Lang missed the opportunity to enlighten readers more about scientific method and standards of evidence, based on replication and verification of contested studies, which in the Pusztai case apparently never happened. On the science and public—and professional—opinion management, food and nutrition anthropology courses would be better served by a selected set of articles, beginning with Glen Stone’s “Both Sides Now” regarding polarizations, more recent writings by him and his students, and updates to my own writings on “food systems” analysis of ag-biotech, and country- and crop-specific case studies comparing, say, Food First’s (Institute for Food and Development Policy) and Monsanto’s treatment of the same issues. Agricultural biotechnologies and genetically-engineered crops and foods are, furthermore, a moving target. Already, the specific cases of industrial mergers and acquisitions are out of date. Monsanto is not buying Syngenta, but is under purchase and sale scrutiny regarding its acquisition by the German firm, Bayer. Syngenta now is under scrutiny in a proposed merger with Chem China. The gene-editing techniques introduced by CRISPR promise to thoroughly revolutionize molecular breeding of crops, which use their own DNA without GM gene transfers, and so will be subject to a different regulatory apparatus. China is positioning itself to be the largest player in molecular-based breeding and crop developments. The Bill & Melinda Gates Foundation is a major facilitator in transferring technologies to the Third World and paying for transparent and trustworthy communications in the First World. The book’s appendix on “organizations” lists seven sources of information (Codex Alimentarius, Council on Biotechnology Information, FAO, Greenpeace International, ISAAA, the non-GMO Project, and WHO). Superior, up-to-date resources can be found on the U.S. National Research Council’s Genetically-Engineered Crops (2016) interactive website https://nas-sites.org/ge-crops/, which is searchable. An hour-long seminar presented by one of the NRC panel’s participants, Tim Griffin, clearly summarizes the findings, showing risks and benefits (no health or safety issues—yet; and no demonstrable intrinsic improvements in basic-commodity crop yields). It also emphasizing the need for constant vigilance (abstract and video available on-line at: https://nutrition.tufts.edu/event/2016-10-05/friedman-seminar-tim-griffin). Another place to follow technical developments is Cornell University’s (pro-GM) “Genetic Literacy Project” (access at: https://www.geneticliteracyproject.org ). Cornell also posts (free) on-line course websites, where issues can be studied along with the blogs of their anti-GM respondents, e.g., http://www.counterpunch.org/2016/10/05/cornell-faculty-refuse-to-defend-gmo-crops/ ). These sources ably cover the science-technology issues, but there is no comparable university or government website neutrally analyzing the social and ethical concerns. The social and ethical issues, to the extent that they are discussed, relate more to human than food-crop genome-editing. New CRISPR techniques promise to revolutionize crops tailored to hazardous environments and particular health risks. New start-ups are endeavoring to engineer multiple components of soil micro biomes or mobilize a plant’s own genetic resources against pests or environmental perturbations. But what are the implications for production and distribution of food crops that might reach those who are most vulnerable to higher temperatures and sea levels, undernourishment, and insecure livelihoods? In what ways might the priorities and products of genetic engineering improve equitable access to the nutritious foods particular peoples need and want to eat? Do particular hungry places require genetically-engineered crops? Or do they need more democracy and socioeconomic access to land and livelihoods, that are being undermined by the very processes of globalization associated with GMOs? It is this social-ethical gap in understanding that Lang’s book tries to fill. This is the second entry in the “Food Controversies” series edited by Andrew F. Smith, who authored the first contribution: Fast Food. The Good, the Bad, and the Hungry. Responses to these writings can be productive and instructive, even or especially where one encounters inadequacies.